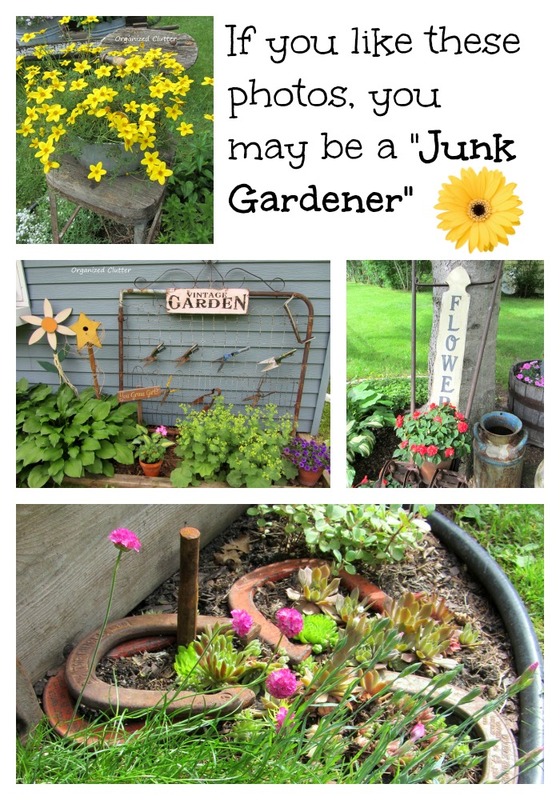 Junk Gardening: You Either Get It or You Don't! What makes a crazy lady place an iron horse shoe game around succulents in a garden? What city girls need milk cans and old cultivators? Who has dozens of galvanized pails, and displays junky old pumps? Who would collect, assemble and proudly display vintage clippers on a gate? WHO would buy this old stool? Who would think to put a large wire basket over a tub of nasturiums? Who would plant flowers in funnels, and decorate a garden with gas cans? Why a JUNK GARDENER of course (like me)! If YOU are a junk gardener, YOU GET IT! I love your Junk garden and wish I had your talent. I'm going to try some on a small scale! I WOULD that's who! I totally get it. I really like the clippers on the old gate. I love your whimsy style. Love those clippers on the gate. I too love to put old vintage pieces in the garden to give some whimsy and fun. Your garden is great. Loved every picture. I totally get it too. I totally get it!! 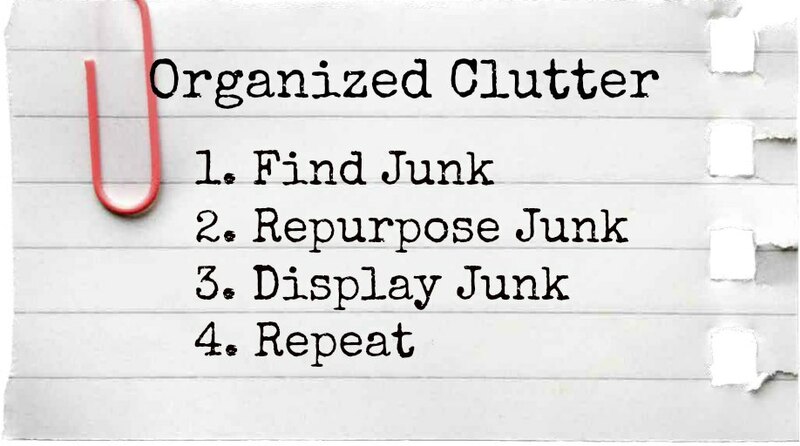 Don't you just laugh when some people say it's too cluttered!! I subscribe to the More is More Theory, don't you?? LOL! I so totally get it. I had it before anyone thought of doing it that way! Wait until you see the little rusty trike I got in PA. My girlfriend thought I was crazy. It was $5.00!! It really is pretty well done in, but I got a box and took in on the plane!! I'm not a junk gardener, but I completely get it! I love it all and wish I had your creativity for this stuff! I get it and I love it! There is plenty of rust in my garden too. I especially love the horse shoes - just might have to add that idea to my garden! I get it!! I love your junk gardening. We need to redo some flower beds and I want to put old junk in it. You inspire me. I love the succulents planted among the horseshoes, Carlene! And the yellow flowers just pop on top of the weathered wood stool. Your thriving flowers are the icing on the cake! I believe I am one! I always love coming here and seeing what sort of junk you have on display around your flower beds... it amazes me the way you spotlight the flowers AND THE JUNK! I too am a junk Gardner! Love that stool! I totally get it too........love junk in the garden! Love your junk garden......I was planning to put junk in my garden this year, but it didn't work out. there's next year....I'll have to collect some new junk tho, hubby threw out some of the stuff I have saved. Thanks for the great ideas!!!! Oh I get it for sure! My hubby doesn't at all. I've been following you for a while now after I found you on pinterest. I LOVE what you do! Thanks for all the inspiration! I totally get it, I have been collecting junk for years and using it in my flower beds. I think rusty and old wood compliment gardens and gardens compliment the junk, what more could you ask. Every time I come home with more junk my husband just shakes his head, he used to fuss, but it didn't stop me and now I think he gets it, but he would never admit it. YOUR gardens are beautiful and have so much character. Thanks for sharing. I love your flowers, so I must be a junk gardener. As a matter of fact, I have junk in my yard and planter beds and enjoy everything very much. You are a great inspiration. I LOVE it! I love junk. Especially rusty old junk! I'm a TOTAL, incurable junk gardener. I love old rusty and chippy stuff. It's fun to see it used in other gardens as well. Great post. Loving it...I love the junk garden look and I am just now trying to get mine that way. thanks for sharing.